Researchers have discovered trillions of dollars in unexplained military spending. We might never find out where it went. In the spring of 2017, Mark Skidmore, an economist at Michigan State University who specializes in public finance, heard what he thought was an erroneous, but interesting, claim: that a Pentagon report indicated the Army had posted $6.5 trillion worth of unsupported accounting adjustments for 2015. He was intrigued, though knowing that the Army’s budget was $122 billion, and that the entire 2015 budget for the Department of Defense (DoD) was $565 billion, he assumed it was an error — the figure was surely “billion,” not “trillion,” already a hefty number for an unaccounted-for adjustment. To his shock, upon examining the report himself, he found no such error: the figure was $6.5 trillion, fifty-four times the spending authorized by Congress. To investigate the matter further, Skidmore got in touch with Catherine Austin Fitts, a former assistant secretary of Housing and Urban Development, and the person who had made the initial claim that had so shocked Skidmore. With the help of two graduate students, Skidmore and Fitts trawled through thousands of government reports to find similar unsupported adjustments. They were shocked by what they found: since 1998, the Pentagon logged unsupported adjustments worth at least $21 trillion, while the Department of Housing and Urban Development registered $350 billion worth. It’s important to understand what Skidmore and Fitts’s findings are, and what they are not. The enormous sums they discuss are what is known as “unsupported journal voucher adjustments,” a more complicated way of saying spending discrepancies lacking an explanation. Whenever there is some kind of accounting discrepancy — for instance, when more money was is than was initially budgeted for — a journal voucher is produced that marks an “adjustment” to the accounting. These vouchers often end up being “unsupported” — in other words, not backed up by receipts and other documentation, or an accompanying explanation of what that money is for and how it was used. But experts are quick to caution against hyperbole when discussing the $21 trillion. “It’s more accurate to say that it’s not properly accounted for than that it’s ‘lost’ or ‘disappeared,’” says Rafael DeGennaro, director of Audit the Pentagon, a group set up to promote its titular concept. That doesn’t mean it’s not a serious matter. For one, there’s the issue of fraud. Skidmore cites accounting professors Jack E. Kiger and Delwyn D. DeVries who point to a range of high-profile cases where managers used such adjustments for a variety of dishonest purposes, including to hide the diversion of funds and to falsely increase revenue. All of the experts I talked to agreed fraud is a definite possibility in this case, though it’s impossible to know how much of the sum can be attributed to it. Then there’s the often baffling nature of the Pentagon’s accounting and lack of transparency. Skidmore singles out a report that indicated just under $800 billion had been transferred from the treasury to the army in the 2015 financial year, the majority of which, according to a footnote, was “related to budget execution adjustments from prior years” needed to set the ledger right. None of this bodes well for the Pentagon’s upcoming audit, the first ever in the DoD’s seven-decade-long history. The push to get the Pentagon audited goes at least as far back as 1990, when Congress passed the Chief Financial Officers (CFO) Act, requiring every federal agency to be auditable. And after that, every agency was audited — except the DoD, which year after year managed to avoid it. The closest it got was when the Marine Corps received a clean audit opinion at the end of 2013, only to have that rescinded by 2015. Now an audit has been ordered only four days after Skidmore discussed his findings on USAWatchdog — something Skidmore doesn’t believe was a coincidence. But how successful would an audit even be? If the DoD’s record keeping is this shoddy, could it simply be unauditable? “They’ve had twenty-eight years, and if this was a priority they would’ve already done it,” says Lindsay Koshgarian, program director for the Institute for Policy Studies’ National Priorities Project. Donald Kettl is more optimistic, if only slightly. “The Pentagon’s record keeping is auditable — but at a huge price,” he says, pointing to an estimate that the enterprise may end up costing as much as $847 million without producing a clean audit. All of this is profoundly frustrating for Koshgarian, whose work focuses on how decades of gargantuan defense spending have impacted much-needed investment elsewhere. If and when the audit does happen, Kettl doesn’t believe it’ll “save taxpayers a dime.” Rather, he believes it will expose the DoD’s shoddy record keeping and suggest a direction for future improvements. There’s no shortage of ideas. They range from strengthening the Pentagon’s independent testing office, responsible for evaluating programs and deciding whether or not to cut funding for them, to putting in place new procedures to better track future spending. DeGennaro also points to legislation that sets up financial penalties for refusing to comply with existing law, such as the Audit the Pentagon Act of 2017 introduced by Rep. Barbara Lee (D-CA) — best known as the lone vote against Bush’s AUMF on September 11 seventeen years ago — which would cut the DoD’s discretionary budget by half a percent if it failed to undergo an audit. One particularly effective avenue could be to focus on defense contractors, who at last count hoovered up 60 percent of all federal contracting dollars. As far back as 2008, the GAO warned that the DoD’s ever-increasing reliance on contractors left it “vulnerable to contracting fraud, waste, or misuse of taxpayer dollars, and abuse.” The companies listed in the Project of Government Oversight’s top ten contractors — all but two of which are military manufacturers and all of which are defense contractors — have in some cases racked up dozens of cases of misconduct. 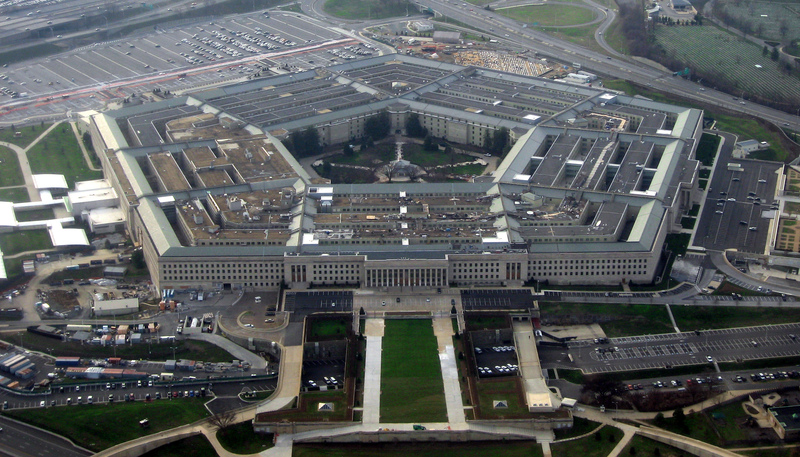 This is partly because of the defense sector’s perceived importance as a jobs program: few officials, particularly elected ones, are itching to take on a company that employs thousands of people in their home states, even if investment in green energy, education, and health care creates between 50-140 percent more jobs than money spent by the Pentagon. Yet in the absence of robust government investment in these sectors, defense manufacturing is the only government jobs program in town. There’s also another solution that doesn’t rely on law changes or accounting improvements: a shift in foreign policy. “One of the biggest Pentagon wastes of money is the idea that the United States needs to use its military to solve all the world’s problems,” says Koshgarian. Of course, this is easier said than done. But we already know there are significant electoral benefits from taking an anti-interventionist position in foreign policy — that fact, along with the moral and practical objections to yet more wars, could make it an increasingly key priority for any enterprising politician. The Pentagon’s poor accounting practices will always be a secondary consideration to the carnage and anger its policies create. Yet such bizarrely colossal sums of unaccounted-for money represent the way in which the military has become, in DeGennaro’s words, a “giant self-licking ice cream cone,” and one seemingly removed from scrutiny as well as public and political discourse around national priorities. Its coming audit may not be a panacea, but it could well shine a much-needed light on a corner of the state that’s long been kept deliberately dim.